Product information "Catalase Assay Kit"
Catalase (EC 1.11.1.6, 2H2O2 oxidoreductase) is an ubiquitous antioxidant enzyme that is present in most aerobic cells. Catalase (CAT) is involved in the detoxification of hydrogen peroxide (H2O2), a reactive oxygen species (ROS), which is a toxic product of both normal aerobic metabolism and pathogenic ROS production. This enzyme catalyzes the conversion of two molecules of H2O2 to molecular oxygen and two molecules of water (catalytic activity). CAT also demonstrates peroxidatic activity, in which low molecular weight alcohols can serve as electron donors. While the aliphatic alcohols serve as specific substrates for CAT, other enzymes with peroxidatic activity do not utilize these substrates. In humans, the highest levels of catalase are found in liver, kidney, and erythrocytes, where it is believed to account for the majority of hydrogen peroxide decomposition. The Cayman Chemical Catalase Assay Kit utilizes the peroxidatic function of CAT for determination of enzyme activity. The method is based on the reaction of the enzyme with methanol in the presence of an optimal concentration of H2O2. 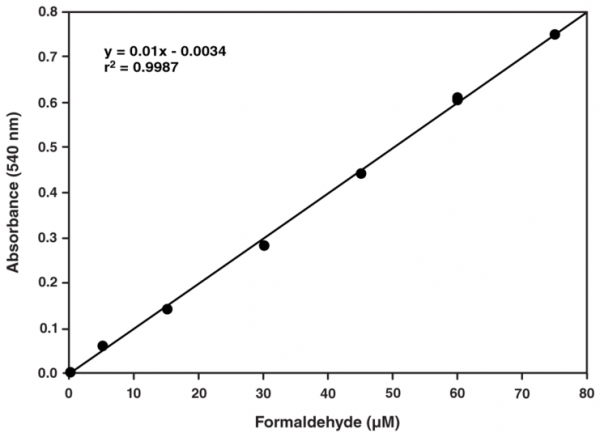 The formaldehyde produced is measured spectrophotometrically with 4-amino-3-hydrazino-5-mercapto-1,2,4-triazole (Purpald) as the chromogen. Purpald specifically forms a bicyclic heterocycle with aldehydes, which upon oxidation changes from colorless to a purple color. The assay can be used to measure CAT activity in plasma, serum, erythrocyte lysates, tissue homogenates, and cell lysates. Customer review for "Catalase Assay Kit"